Don't let the long recipe alarm you - it's really not bad! 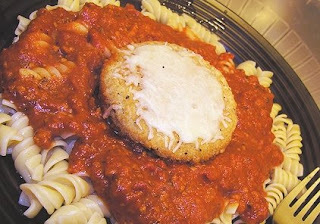 And this goes together faster and easier than a baked Eggplant "Parmesan" casserole. Enough dry pasta for 4 people - you judge how much you'll eat. Mix Vegenaisse and soymilk into a thick liquid in another bowl. 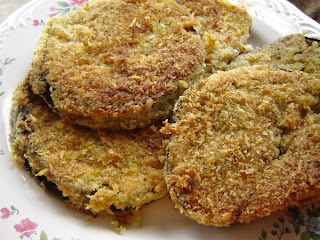 Dip eggplant slices into soymilk mixture (like "egg") and then into breadcrumb mixture. Place in medium-low well-oiled skillet and cover. Let slices slowly cook until browned but not burned, then turn CAREFULLY and cook/brown other side with pan uncovered. Eggplant should be soft in the middle. Set aside when cooked. Cook all eggplant slices, adding oil as needed. Set eggplant slices on cookie sheet. Place a several tsp. shredded Vegan mozzerella on each slice. Place cookie sheet as FAR from broiler element as possible. Broil until Vegan cheese liquifys/melts. This happens VERY fast once it starts to melt, so watch it carefully!! My bf dislikes eggplant (but at least he converted to veganism lol), so I was wondering if eggplant tastes neutral in this or no? I rarely make eggplant because I don't care for the complaints and scrunched up faces that occur when it is mentioned LOL. Mmmm! I've been craving breaded eggplant for a while now! Thanks for the recipe. A classic meal, veganized = YUM!! I'm always looking for more ways to use eggplant, and this looks delicious! I'll keep this in mind when looking for ideas for all the eggplant available at the farmer's market right now! Oh yum! The eggplant looks so delicious, I'd just eat it like a veg burger! Thank you for the recipe. WOW! i'll have to fix that for my itallian spouse. This looks super good, your coating stuck way better than mine did when I tried!